The USD/JPY has pierced the lower trend line of the dominant ascending channel pattern. It is signalling that a head and shoulders pattern exists on the charts. 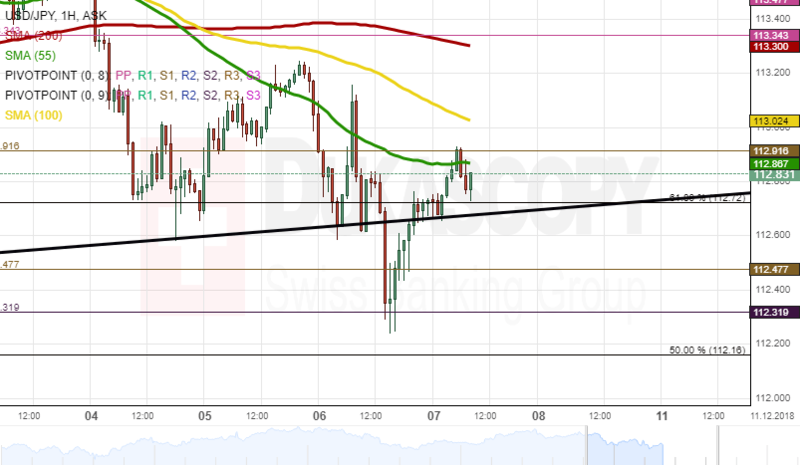 In general, the breaking of the support level indicates that the decline of the USD/JPY should continue. On Friday morning the currency exchange rate was squeezed in between a Fibonacci retracement level at 112.70 and a pivot point at 112.90. It was most likely expected that the 55 and 100-hour simple moving averages will approach the rate from the upside and push it down through the Fibo retracement. On the other hand, the Fibo might hold due to the strength of the already pierced trend line. The reason for this assumption is that the rate had been still influenced by the trend line of the pattern after it returned to the borders of the broken pattern.